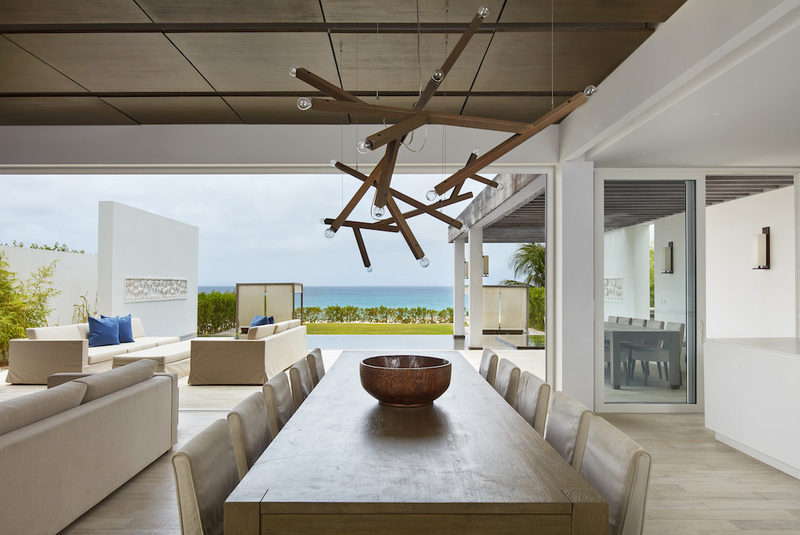 Designed by Taylor Smyth Architects and Cecconi Simone Inc., Kishti on Meads is a luxury two-villa enclave on fashionable Meads Bay Beach in the Caribbean island of Anguilla. The villa with six main bedrooms has ensuite bathrooms offering garden or ocean views, rooftop and courtyard gardens, an infinity pool with ocean view beyond, and a hot tub. 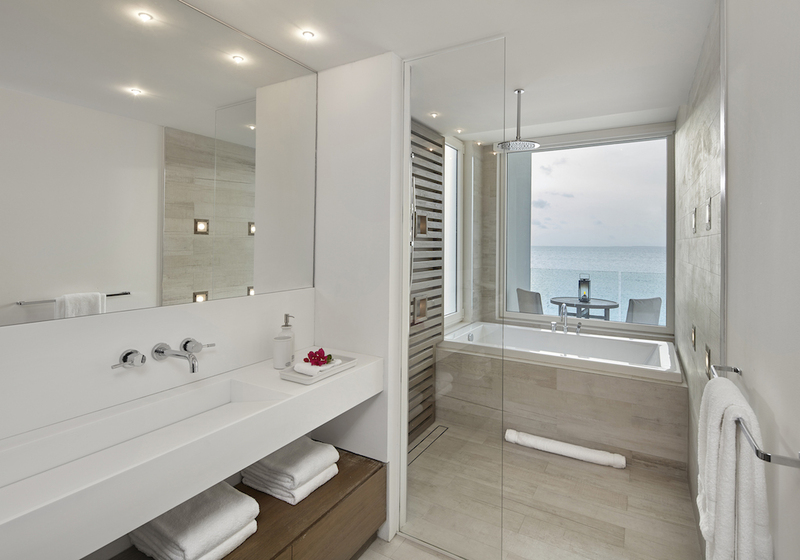 The five-bedroom villa includes one master suite with his/her bathrooms and dressing areas. Each Kishti villa complex comprises 4,650 square feet of interior and 4,372 square feet of terrace and outdoor living space. From grand gestures, such as view corridors, to details, every aspect of the project reinforces the prevailing understated, relaxed contemporary minimalism. “Kishti,” an Urdu word for boat or canoe, expresses a mystic sense of being at one with the sea. Indeed, at the property, the natural and manmade come together to create a serene atmosphere, thanks to the unified design vision. Interior Design, custom fixtures and furnishings as well as artwork, such as the palm-tree bas-relief overlooking the pool were created specifically for the project while others were curated as was the case with the triad of plaster Balinese monks who give a feeling of arrival and sanctuary as one traverses the courtyard. 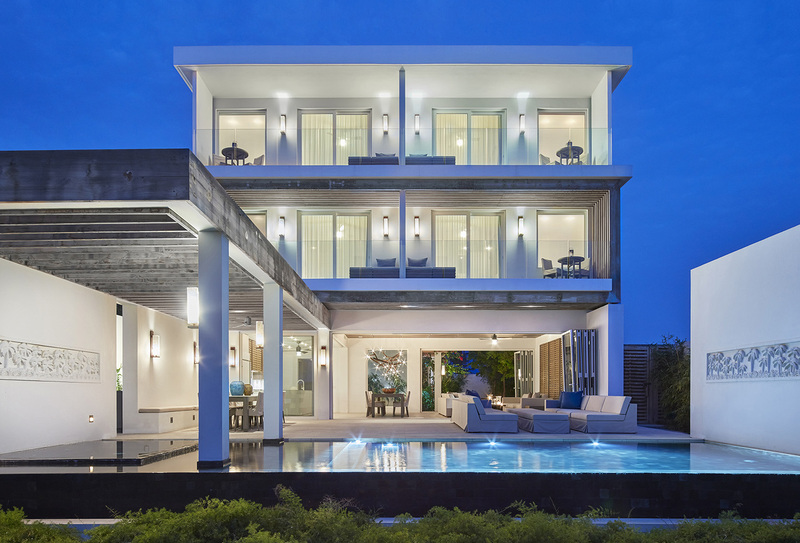 The client wanted to locate two villas on a relatively narrow, 96-foot-wide lot boasting beach-front views while maintaining privacy between the villas and from the public road. 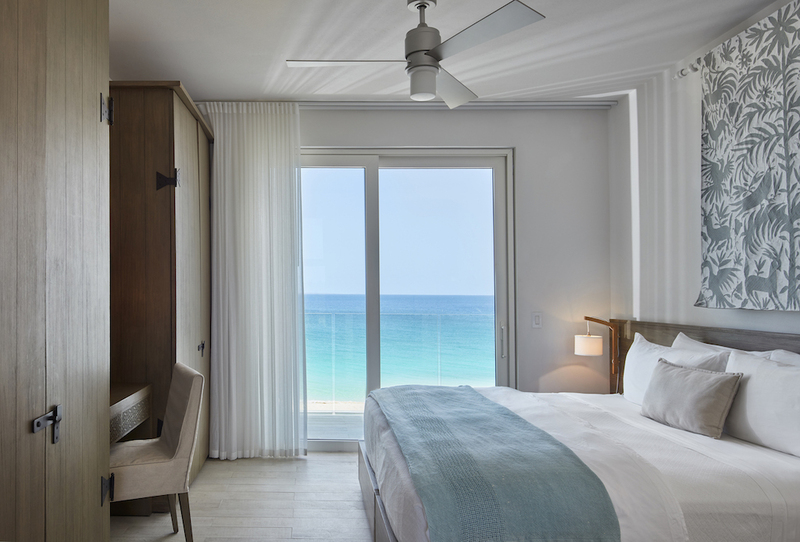 The island’s tropical heat, humidity, salt air and termites restricted the materials palette, ruling out the use of softwood lumber and laminates; even concrete needs a special coating. Few building materials are available locally, which complicated construction logistics and co-ordination of delivery schedules. The deep building lot was exploited by staggering the villas, placing one forward and closer to Meads Bay Beach and the other one well-back, near the Meads Bay Pond inlet. 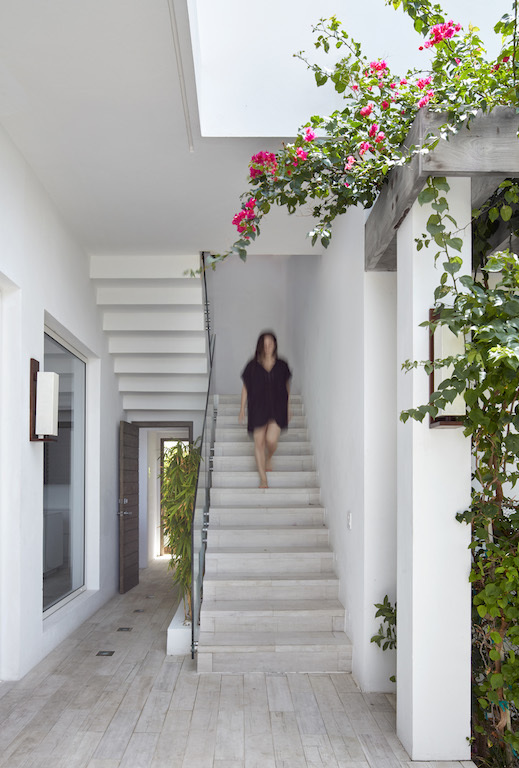 From the road, the Kishti villas’s monolithic blank walls (to be enlivened by climbing bougainvillea) evoke the abstracted monumental houses of Mexican architect Luis Barragán. At the largest, urban-planning scale, the project conveys a thrilling sense of arrival. Once inside the gated entrance, a row of trees serves as a forced-perspective foreshortening device to create a feeling of progression as one approaches the villas. One of the focal points is the courtyard garden with a water feature inspired by Carlo Scarpa’s fountain at Venice’s Fondazione Querini Stampalia. 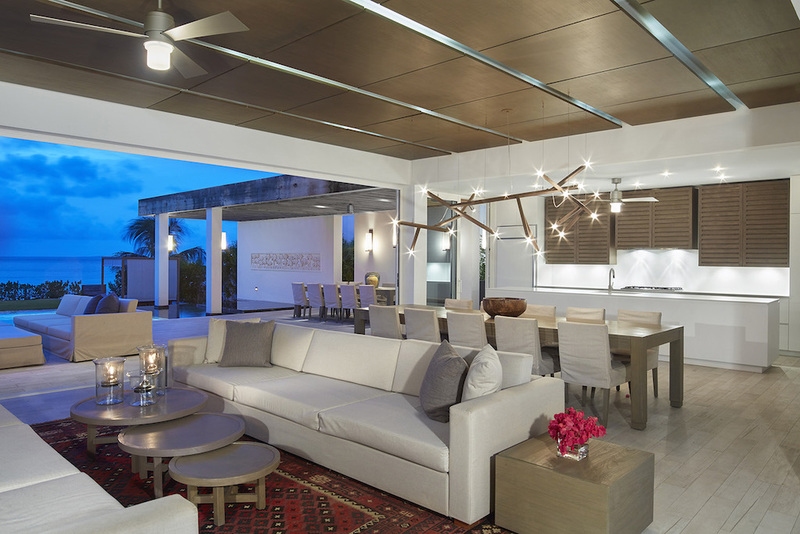 As one enters a villa, breezeways frame views of the infinity pool and ocean beyond. Then one enters the main living/dining area, whose fully retractable glass doors blur the distinction between interior and exterior. The extensive landscaping conceals back-up generators and waste-water treatment plants. Environmental amenities including a permeable gravel driveway that slows rainwater runoff, which retards soil erosion during hurricanes. 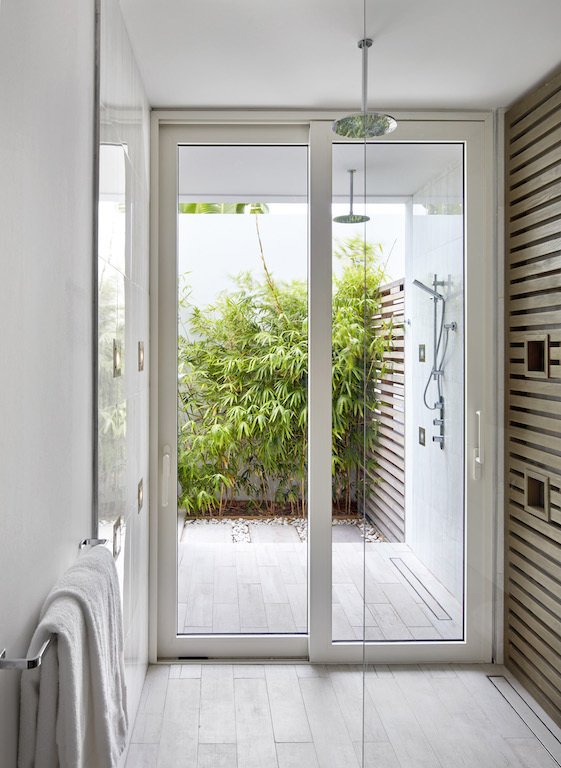 The climate-appropriate materials palette comprised concrete block and reinforced concrete, solid teak and Ipe wherever wood was specified, and Corian solid surface material in kitchens and bathrooms. To overcome local unavailability, all fittings and furnishings were custom-designed, made in Bali and assembled on site. This required careful mapping of locations for lighting, paneling and sound system.